Leslie Dillon in an undated photo, probably taken in the late 1940s. 5. Leslie Dillon was cleared by police after an exhaustive investigation. 4. Leslie Dillon had no connection to Mark Hansen, the business manager at the Florentine Gardens. (For those who are new to the Black Dahlia case, Elizabeth Short stayed at Mark Hansen’s home while she was in Hollywood). 2. 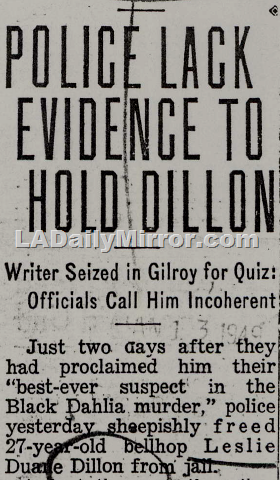 Leslie Dillon had no connection to Elizabeth Short. 1. Leslie Dillon was absolutely, positively in San Francisco when Elizabeth Short was killed. This entry was posted in 1947, 2017, Black Dahlia, Books and Authors, Cold Cases, LAPD and tagged 1947, black dahlia, Books and Authors, cold cases, lapd, Leslie Dillon, Piu Eatwell. Bookmark the permalink. Very compelling. Need to check with Wikipedia ;). In the meantime, Merry Christmas to you and to all who stalk these pages. A new book and a new accusation will appear every few months until someone accuses the actual killer. You know, like the infinite number of monkeys with an infinite number of typewriters. I’m waiting for updates about and samples from *your* own Black Dahlia book! Pretty please!